Everybody, who has ever played the guitar will notice sooner or later that the tuning of the instrument bears some problems, regardless if an electronic tuner is used or the process is done manually. If e.g. all octaves are tuned perfectly in the first position, this won’t hold true anymore further up the fingerboard.Now I will try to explain the reasons and possible solutions as clearly as possible. The subject of musical tunings has been discussed for thousands of years and many books have been written about this. For those who want more detailed information regarding this, here are some links. For all others, here is the short form: On guitars the aim is to obtain a tempered tuning like on a piano. This means that an octave is divided into twelve equal semitones. This leads to the fact that (except the octave) no interval is exactly in tune. The advantage is, that this little difference is exactly the same throughout all of the keys. This system has a mathematic equivalent: Any frequency divided by the 12th root of 2 (=1.0563332) twelve times will result in half the value. Each division inbetween produces the next semitone of the chromatic scale. Interestingly, this rule finds a match in string lengths of musical instruments. The oscillating string is behaving in reverse ratio to the frequency. This means that e.g. half the string length leads to a doubled frequency. From what is written above we can conclude that e.g. the 12th fret on a fingerboard should be exactly in the middle of the open string from the nut’s edge to the saddle. In reality this doesn’t work for a number of reasons. I will pick out the two most important ones here only:The first effect is the extra tension given to the string when pushed down to the fret. By this, the pitch because of this moves up.The second problem is related to the (various) stiffness of the strings. The strings don’t move as on a hinge up and down but “bend” into their motion slightly inside the support points. The scenario is further complicated by the fact that each string has a significantly different stiffness and for this reason will also react differently. All solutions for the problems described above are based on the manipulation of string lengths to compensate the pitch-faults. 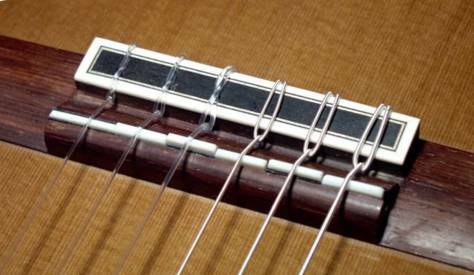 The easiest method to compensate takes care of the “extra tension while fretting” thing, but ignores the various stiffnesses. It is assumed that the action rises from the high to the low strings. The raised pitch is compensated by an elongation of the string towards the saddle. This is done by moving the saddle position back, namely more on the bass strings than on the trebles. The result is the well known slightly diagonal saddle. Incidentally, steel strings react more intensively with the extra tension. For this reason, the added length is significantly larger than that of Nylon strings. Reasonable values for the “extra-length” on classical guitars are about 1.0 to 1.5mm for the high E-string and 2.0 to 2.5mm for the low E-string. For steel-strings it will be about 2.0mm for the high and about 5mm for the low E-string. The ideal value of course depends also on other factors such as the bow of the fingerboard and the string gauge.What is this solution worth now? Well, in my opinion this will already lead to proper results if done carefully. If all guitars could match this standard, a lot of frustration could be avoided. Especially on classical guitars I see this as a fairly good compromise if e.g. it’s unclear which type of strings (Nylon or Carbon) will be used, because these behave very differently. As already mentioned , a setting as described above is by far not the optimum. Why? Quite simply, because we only considered one end of the string and completely ignored the other! To optimise this, we have to do the opposite of what we spontaneously would think to be right. At first sight most people would probably move the saddle point towards the head with rising stiffness of the string. Tests have proven that just the opposite brings good results. 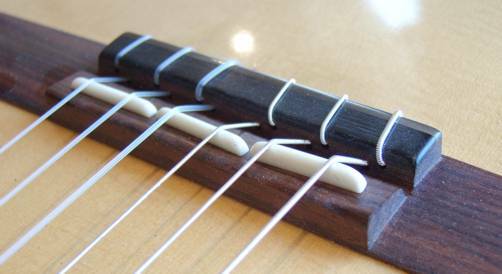 By shortening the fingerboard for the stiffer strings, all frets practically move to the nut not by a factor but by a fixed value. So the string lengths of the fretted notes are elongated in relation to the now created “artificial” scale length. This effect is strongest in the lower positions and becomes less higher up the fingerboard because this “fret-shifting” follows a constant value and becomes relatively smaller. This is what most concerning of people see as the ideal set-up at the moment. Personally I am a little bit sceptical if this last step is really the best solution for the following reasons:First of all the setup has to be changed with each change of string material. This means that a new (“trick”-) nut has to be made, which is definitely more work than a new saddle or only readjusting a variable saddle solution (see below). Secondly, the actual scale length is hidden and harder to reconstruct. Finally almost every one who complains about intonation problems reports about the higher positions in particular. So in my opinion the little (but surely existing) advantage of this scenario is eaten up by the complication it also brings. As already indicated , all the previous solutions are still compromises. To complete this I must report about the existence of the “non-compromise” construction: Some decades ago the German luthier Walter Voigt developed a fingerboard with movable frets. More than this, the frets can be moved for each string individually! This means that every single note can be tuned to whatever you want. So the possibilities do not stop at a well-tempered intonation, other temperations also can be acieved. When playing a piece in F-major e.g., all A’s could be tuned to pure thirds e.g.. Even bad string material can be compensated to some degree.Unfortunately this system has some very pragmatic disadvantages: First of all, it takes a huge effort to adjust all frets and if you take it seriously, you will have readjust it with every new set of strings. Secondly, the technical effort to make such a fretboard is also huge, which of course leads to an exorbitantly high price. These fingerboards are still produced by a French luthier in Germany. I’ve placed a link below. Of course, the “standard scenario” is the easiest one to realize. It’s only necessary to make the usual, fixed saddle with the support point at the right place. All other approaches require a few more thoughts:For the saddle with “string by string” compensation a decision must be made whether a fixed or variable solution is preferred. The fixed one (see picture 1) of course has the advantage that neither the adjustment nor any small parts get lost whilst strings are changed. On the other hand the possibility to readjust the intonation (e.g. when changing to different type of string) is lost. On picture 3 and 4 I’d like to introduce two variations of adjustable solutions for the saddle. Picture 3 is based on the “FABS” (free adjustable bridge system, see links section). There is one bone element for every two strings. These are not guided in a slot but only sit loosely on the front part of the bridge-centre. The advantage is the possibility to adjust the intonation completely free for each string. The disadvantage is the tendency for the pieces to slip away during repeated tuning procedures and too possibly get lost whilst changing the strings. Another con is the limited possibility to adjust the guitars action, because the height of the pieces is more restricted than with a conventional saddle. Picture 4 shows my favoured solution: In a slightly widened slot there are 6 separate elements. Each of them is accompanied by 3 very thin (0.3mm) fibre plates to fill up the slots width. Now each segment can be placed in front or behind as many fibre-plates as required and in addition be turned around. This results in 8 positions in 0.3mm steps for every single string. Experience shows these steps to be fine enough for the most discerning of ears. The advantage is that once done, the adjustment won’t change anymore and (provided they fit snugly) no parts will fall off. So, after an initial adjustment, one doesn’t have to worry constantly about his saddle setup but still preserves the option to do so if needed.As for the nut, a related solution could be considered. I’ve never actually tried it because as I prefer the nut left untouched as previously mentioned. Finally, I’d like to point to a few other influences which can annoy the skilled ear: The first being, of course, the strings. Unfortunately, there are still numerous strings on the market which do not fulfil the basic needs regarding pure intonation. This means that the strings need to have an absolutely constant diameter (and weight) over the entire length. 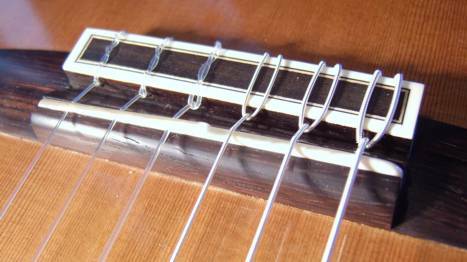 An uneven string will behave differently on every fret or may even be unable to produce any pure note at all. Such strings will destroy any attempt of proper adjustment.Another common constructional fault are fingerboards cut too short at the nut. Especially on Students instruments (but also on some better pieces). 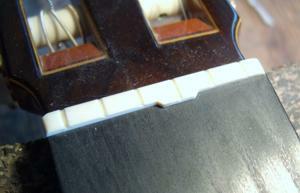 In many cases the frets are placed perfectly, but the distance to the nut is wrong. This often leads consequently to a false bridge position. The common “quick test” by comparing the fretted 12th position to the flageolet is tricky here and will lead to massive intonation problems in the lower positions because no fret (and especially the first ones) matches the octave anymore.One further problem is hidden in a neck which is too bowed, because the “extra tension” effect is very strong on the first frets here already.As you can see this subject is a wide field and a lot more could be written here, but I think the above gives a comprehensive summary of the most crucial facts. For those who want more detailed information, I’ve collected some related links just below. Here (or from here) you’ll find information to all general subjects regarding our tonal system and related items. another, partially controverse article to this subject by my collegue Sebastian Stenzel (pdf-file). Hervè Chouard, the successor of Walter Vogts “fine-tuneable guitar”.